For comic strips you have to submit directly to the companies by mail mostly. Some do accept email submissions. Never submit original art by mail. Don't be fancy just staple your photocopies together and put it in an envelope with your cover letter. Insert some cardboard to protect it. Always send an SASE (self addresses stamped envelope) with it. In the comic strip industry there are syndicates that distribute the strips to newspapers. The syndicate purchases rights to your strips, reselling them to newspapers and magazines. Usually it's a 50/50 split on income received from newspapers to carry the strips. Don't expect to be getting a salary. 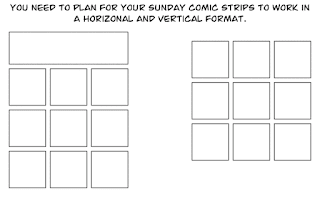 Strips are usually created 4 weeks in advance for dailies and Sundays 8 weeks in advance. Don't try to become a comic strip artist unless you know you can come up with ideas everyday on this schedule. Create something from your heart, not something where you are trying to ride a fad. Do what you care about and the audience will gravitate to it. Decide whether your strip is going to be a gag strip or soap opera. Be sure to put your copyright notice on all of your work. Syndicates each have their own submission policies, however generally you must have 4 to 6 weeks of daily strips and 2 full color Sunday strips. Make sure it is a good introduction of you characters. Draw more strips than you submit so you have developed the characters and know them inside and out yourself. 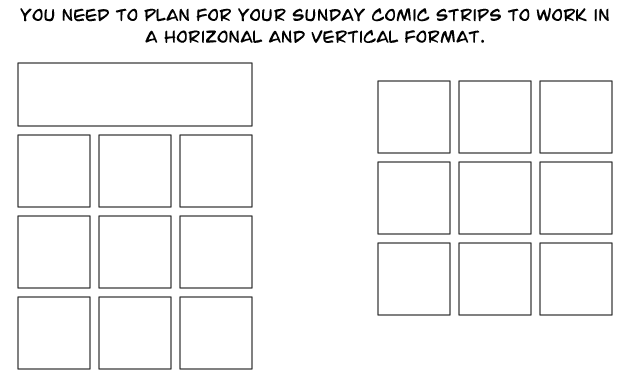 Most strips are drawn at twice the printed size. You can draw at a ratio that's comfortable for you. You can also independently submit your strips to editors at individual newspapers or publish as a web-comic. After you submit to a syndicate all you can do is wait. Whoa! Hold on there partner. Don't do anything! There's nothing you can do but wait, so gird your loins! Syndicates receive thousand of submissions a year and only choose 3 or 5 to distribute and put their marketing money behind it. If they don't feel they can get a return on their investment even after it is picked up, then your strip will be dropped. Stay with it! What may be rejected one year can be accepted next year. Keep developing it. Editor and Publisher magazine has a Syndicate Directory that you can find in the library and online. You can also buy it from the magazine. In the comic book industry you have The Big Two - DC Comics and Marvel. In the comic strip industry you have The Big Three - King Features, United and Universal. Here are some major syndicates to contact. Follow their submission guidelines exactly! How Much Money Does a Newspaper Cartoonist Make? How Much Does a Cartoon Artist Make? Please support me making video tutorials on Patreon.